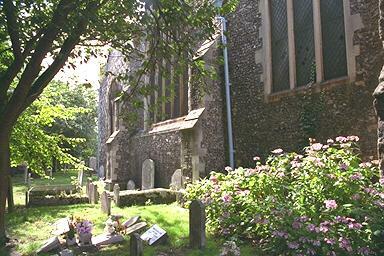 In a short distance, you are in a cool shady churchyard. If we carried on we would hit the main Canterbury Inner Ring Road, and you can hear the noise of the cars passing while standing here. Sorry, for the moment, all you can do here is turn around. In fact, the next photo is actually taken a little further along the path. Photograph August 1996. © Copyright Peter Collinson, All rights reserved.